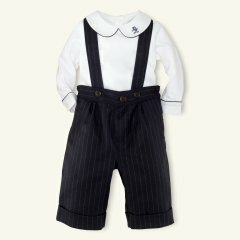 This essential set pairs a classic pinstripe overall with a soft cotton jersey bodysuit. Cotton bodysuit has a twill club collar with signature embroidery, three-button placket at the back, barrel cuffs and snaps at the ribbed hem. Pinstripe overall has cross-at-back shoulder straps with adjustable button closures on the back and button closures on the front and sides. Welt pockets at the sides. Cuffed hem.